This morning, the official Box cloud storage application for Android received an update through Google Play, one which brings new features, enhanced functionality, and more. While there are plenty of new things to talk about, the main highlight of the update is Box Notes. 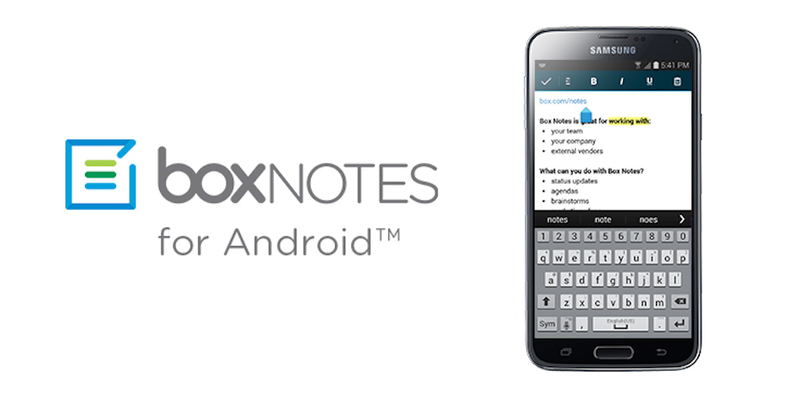 Released for iOS not too long ago, Box Notes allows users to take notes through the web interface of Box or on the app, while also allowing other Box users to collaborate on Notes through whichever platform they are on. Think of it as Google Drive, except with Box, you have access to your files through their platform and can work seamlessly throughout their realm of servers. In addition to Box Notes, Box has added in new languages, a Checklist feature (which is included in Box Notes), and Box even claims they have more new features coming soon. The update should be live on Google Play, but if you don’t see it yet, allow the update to populate Google’s servers.